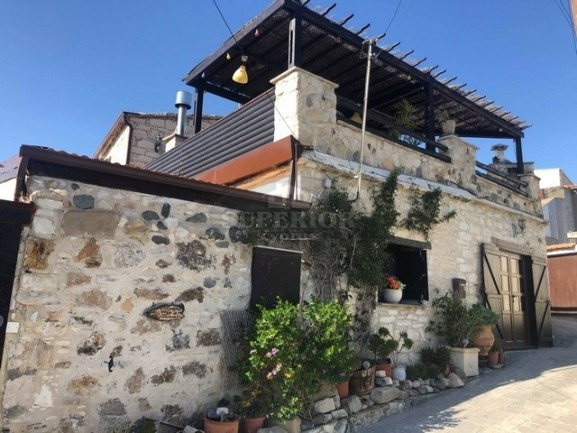 A superb traditional stone house located in ideal surroundings, just a short drive to Limassol and within walking distance to the center of the village and amenities. The house offers 3 master bedrooms (all with en-suite bathroom) and separate entrances, 2 kitchens (a main kitchen with dining area and a good size kitchenette/ utility/laundry room), a total of 4 bathrooms, a very spacious living room with fireplace and an office which can be turned into a smaller guest bedroom. The house was originally built approximately 150 years ago and it has been fully renovated (from the foundation) in 2007 and very well maintained since. The renovation included new electrical wiring, new pipes, new roof, etc. The house can be offered furnished or unfurnished and it comes with a modern fully equipped kitchen. It benefits from central heating, it has A/C throughout, double glazed windows, wooden shutters, fly-screens on all windows and doors and several storage spaces. The plot covers a surface of 191 sqm and it comes with a small garden/patio, very private and easy to maintain. The upstairs veranda has its own large kitchen, with lots of cupboard space, a BBQ and a generous sitting area. The location is very quiet and serene and there are ready title deeds. Viewing of the property is highly recommended, a house full of character and tradition, offering at the same time all conveniences of modern and comfortable living! Limassol is a city on the southern coast of Cyprus. It’s known for the centuries-old Limassol Castle, home to the Cyprus Medieval Museum and its collection of pottery and tombstones. On the seafront is the Prokymea (Molos) Sculpture Park, with sculptures by Cypriot, Greek and international artists. To the northeast is the Limassol Archaeological Museum, exhibiting artifacts from the Neolithic to the Roman periods.